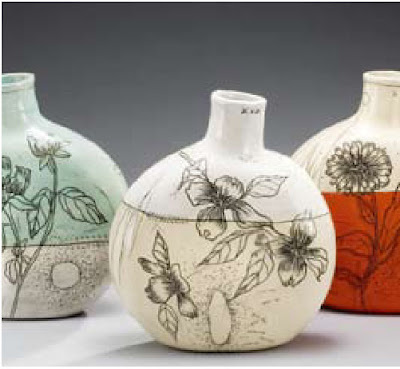 Diana Fayt is a ceramics artist and designer who does the most beautiful drawings on clay, based on inspiration she gathers from nature and everyday life. Based in the USA, Diana exhibits her work in galleries and fine boutiques throughout the US, Japan, Australia and Europe, and her work will soon also be available in the Heath Ceramics Factory Store. I know that it’s rather late notice, but just to let you know that over this weekend, Diana will be participating in the Heath Ceramics workshop series, where she’ll be exploring printmaking techniques on bisqued tiles. If you miss out on this workshop, take a look at the rest of the programme, and if you live near to Heath Ceramics, maybe you can join in on one of their other workshops.